PRNewswire: OmniVision announces the cost-optimized and power-efficient OVM7699 CameraCubeChip and OV7699 CameraChip based on 1.75um OmniBSI+ pixel. The 1/13-inch OVM7699 and OV7699 are said to have the industry's smallest footprint and intended for a wide range of applications, including feature phones, mainstream smartphones, notebooks, wearables and IoT devices, among others. 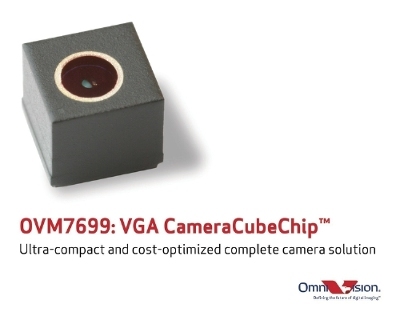 The OVM7699 comes in a 2.1 mm x 2.1 mm CameraCubeChip™ module with a z-height of approximately 2.3 mm, while the OV7699 comes in a 2.03 mm x 2.08 mm CSP. Both the OVM7699 and the OV7699 are currently available for sampling, and are expected to enter volume production in Q1 2016.